How to give oneself a heart attack? Delete a project, lose some media, accidentally trash an important document, or have a hard drive crash on you; that should do it. In the past, trying to recover data from a crashed drive could easily cost a thousand dollars or more, trying to recover any form of media by yourself was often a lesson in futility and the heart pounding, ear shattering screams of "Oh S**T", didn't help at all. ProSoft Engineering has had their data recovery software out for some time but not many people know about it yet. You might never need it, but should the time come that you do, you will be happy that it is there as it does what it says it does, it can recover those lost files and unexplainably trashed media. It arrives in its own box containing a sheet of paper with a serial number you are warned not to lose, and the Data Rescue 3 disc. This is installed via your disc drive and can be then found in your applications folder. 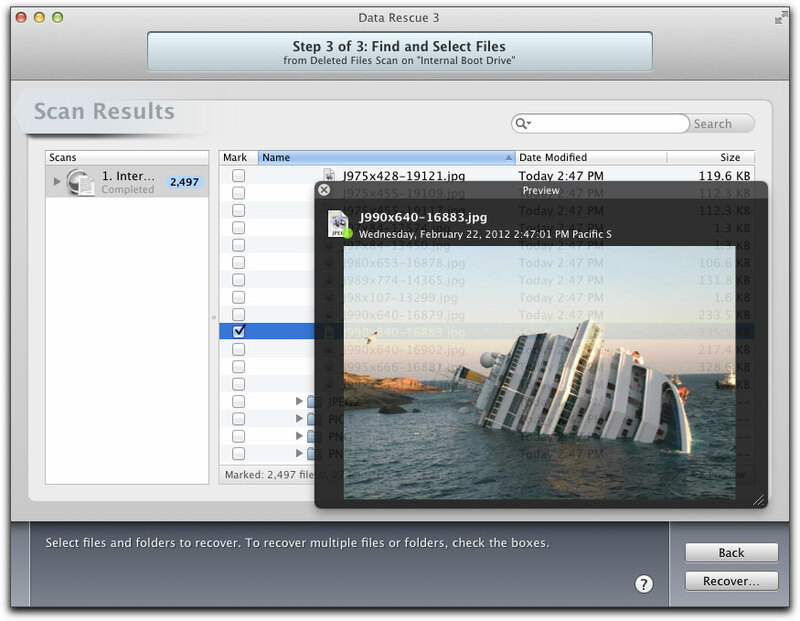 Data Rescue 3 runs as a 64-bit application on Mac OS10.6 or later. This results in both faster scanning of your drives and quicker recovery of lost data. 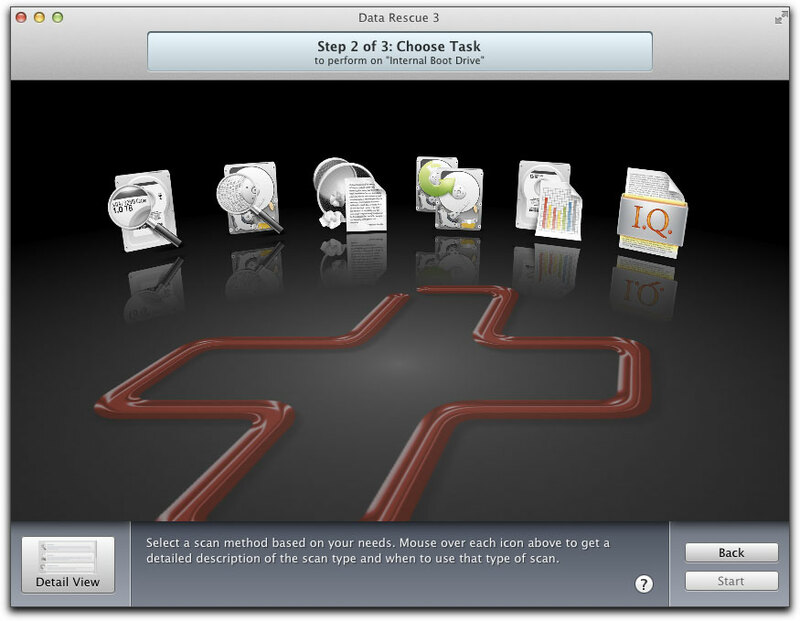 There are several functional choices you can make when using Data Rescue 3. It can do a 'Quick Scan' which will utilize existing directory info should your drive fail to mount and should be the first choice of action if that happens. 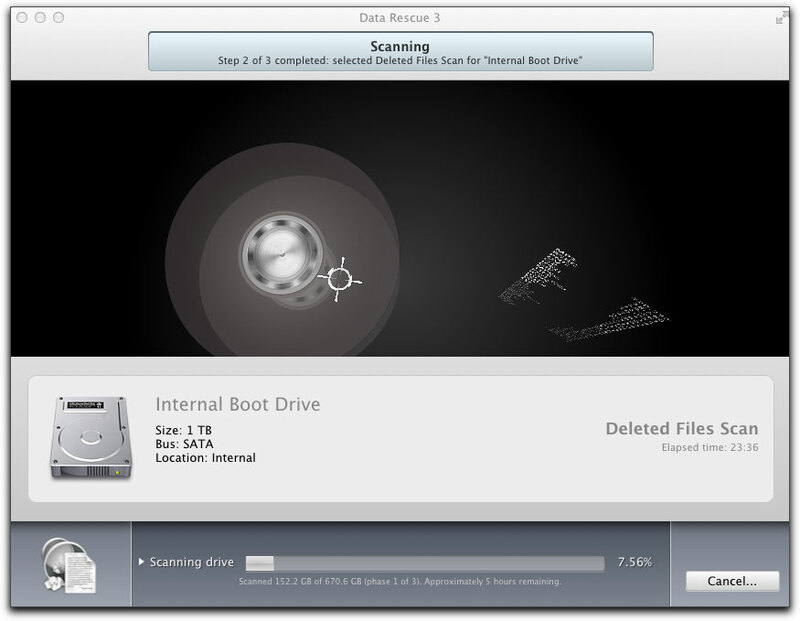 You also have the choice to run a 'Deep Scan' to find recoverable files on your drive. This may take longer to complete than the Quick Scan function and, by recommendation, should be used in only the more severe situations. 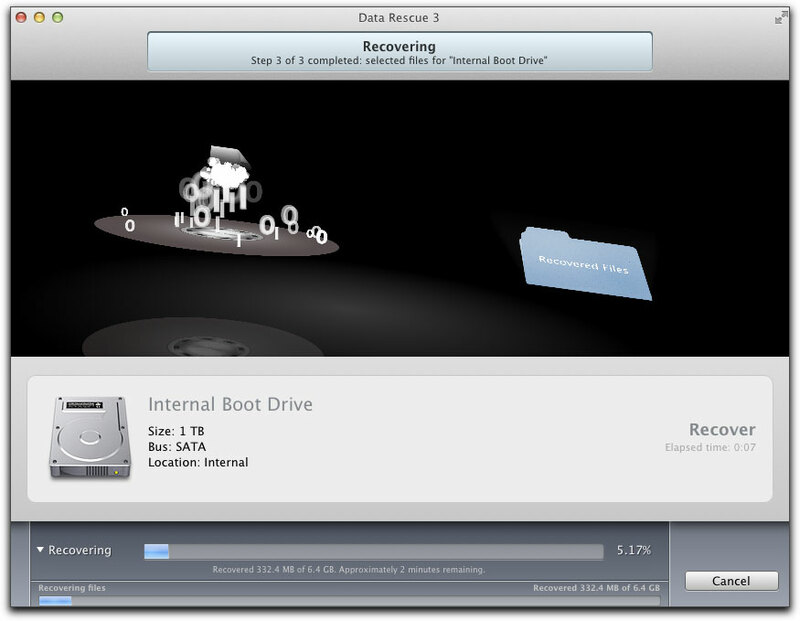 Data Rescue 3 also has a 'Clone' function, which can make an exact copy of your drive. This clone can then be scanned which may help improve recoverability of missing data and can be especially helpful when it may be hardware issues that are presenting problems. Data Rescue's 'Analyze' function verifies your drive's ability to read data but is not used to recover data. Should you have a file type that is not supported or recognized by Data Rescue 3 you use the 'File IQ' to drag the file type to Data Rescue to enable it to learn new file types. 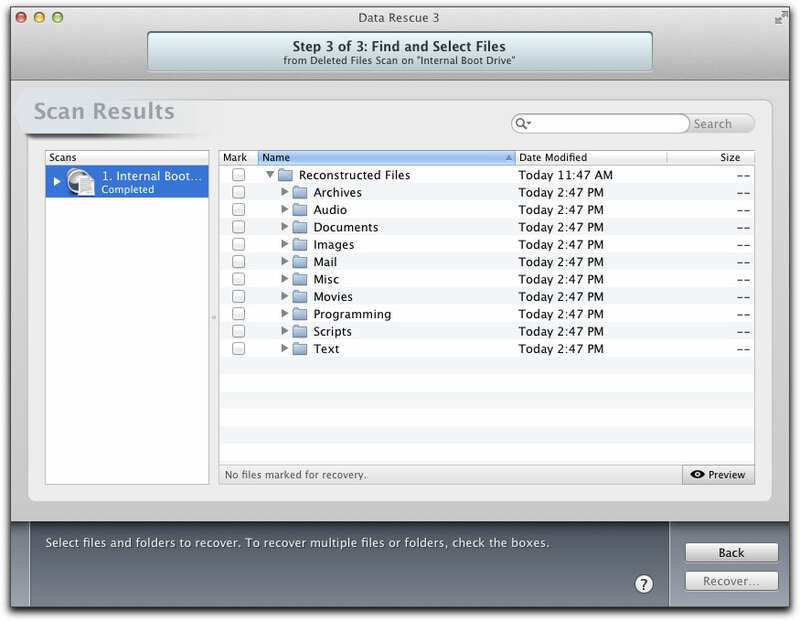 Lastly, the most important function of Data Rescue 3 for me is its 'Deleted Files Scan' which will search your drive for any recently deleted or lost files. This is the one I tested for this review. This function is used when your drive is working properly but files have been accidentally deleted through the Mac OS. It searches only the free space of a volume for any files based on file patterns. 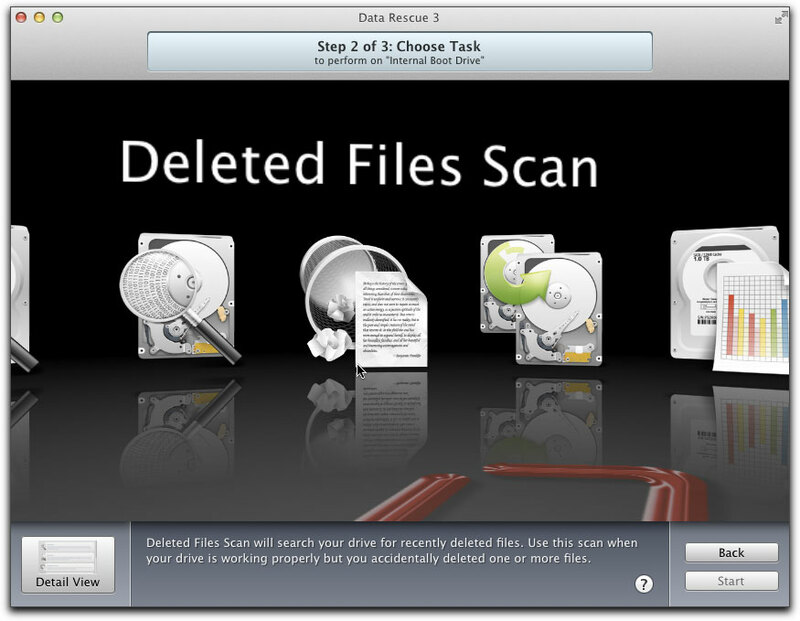 By scanning only the free space, it allows the Deleted Files Scan to specifically detect any files that have been trashed. 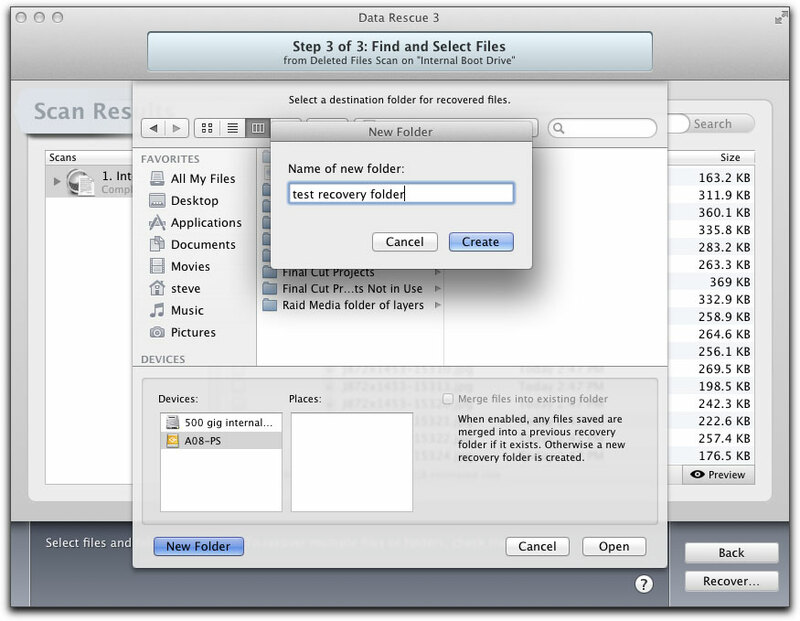 Since deleted files in the Mac OS leave no reference to their original directory structure, file name or date of modification or creation, Data Rescue 3 will not be able to detect the original information of the file in the directory structure but, instead, will rebuild any files that it detects based upon file patterns resulting in generic filenames and organized by category in the Reconstructed Files Folder. 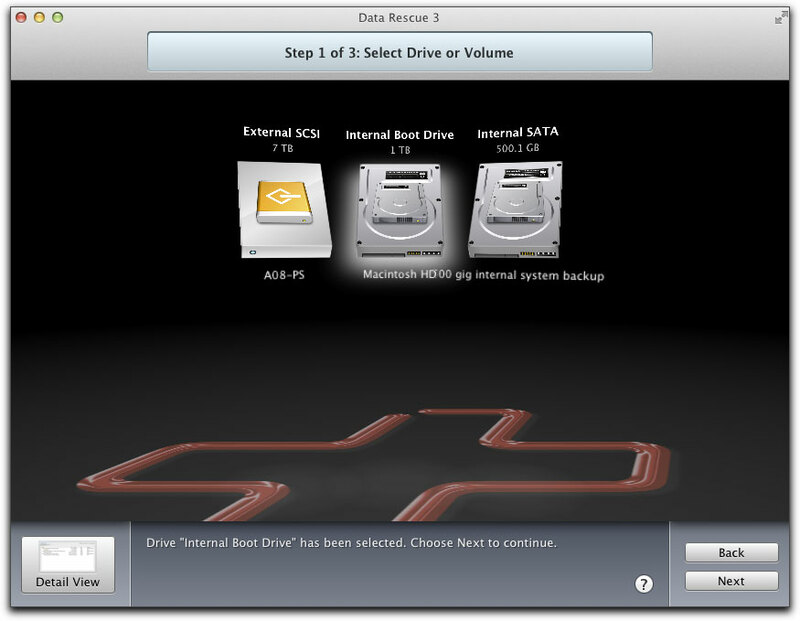 After insertion of the disc, you are asked to select a drive to be scanned. I chose the boot drive which then has a halo glow around it. You are presented the icons for any of the Data Rescue 3's functions. I chose 'Deleted Files Scan" which then enlarges in the window as seen below. 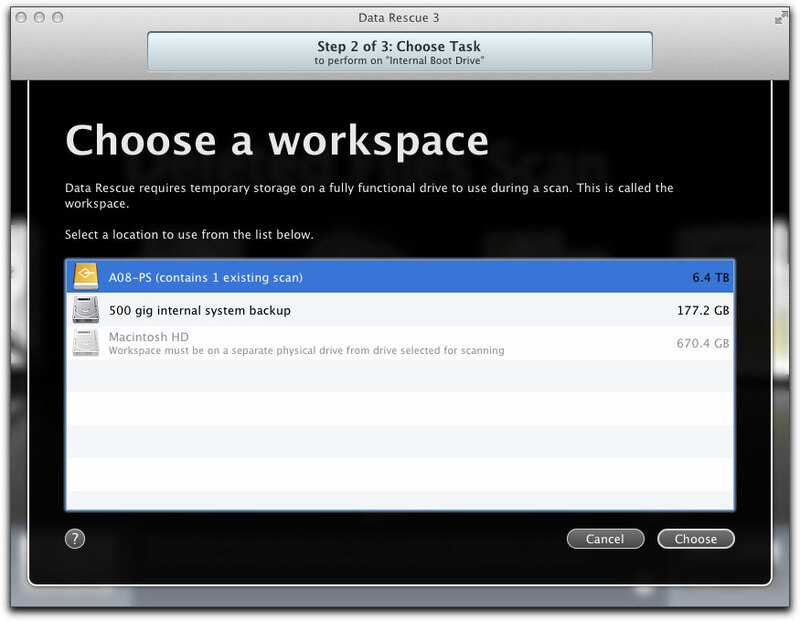 The next step is to choose a destination, or workspace for the Data Rescue 3's file recovery system to send to. In this case, I chose the Accusys RAID which has plenty of empty space should I need to recover a large number of good sized files and media. Since I was testing Data Rescue 3 in order to find a recently deleted article with graphics, I chose the 1TB boot drive to be scanned. Even though I have roughly 660 Gb's of free space on my Mac hard drive, Data Rescue scan's the entire 1TB drive before you can see what it found. The scan took about 4 hours to complete. The animated window that presents itself as the scan is being completed. While this might seem like a long time, and it is, for the scan to be completed while you anxiously pray to the editing and writing gods for recovery of your precious lost material, you, at least, have the knowledge that there is a good chance that all is not lost and that your deleted files will be recovered. Once the scan is complete, a new window comes up with all the many categories of recovered files. Checking the different reconstructed files and using the drop down arrows reveals what has been found. Because the actual names of files have been lost as the directory files were deleted, you are presented a generic numbered listing of any of the recovered files. You cannot identify them by name but need to view them in Rescue Data 3's preview window as shown below. Since Rescue Data 3 allows only one preview at a time, this will be a possibly long, painstaking search process depending upon the category of file. Never the less, your time will be well spent once you actually find the file(s) you are looking for. I do wish that the preview window had a 'Next' button or that I could have used the keyboard arrows to go through the many recovered files. It would have made the process go much quicker as I looked for my deleted article. I did eventually find it and, if I had really needed it, and was not just using it as a Data Rescue 3 test example, it would have been a lifesaver. Once you have located your recovered files, you place a check next to them in the box provided, you have the option of creating a new folder for them or simply sending them to the Data Rescue workspace folder on your chosen drive. Then all you need do is click on 'Recover' at the bottom of the window. In this case, I chose to create a test folder to recover a recently deleted review. The folders as shown in my 'workspace' drive. While the chosen recovered files are being saved to the Data Rescue 3 workspace, a new animated window comes on displaying the files being sent to the workspace. Recovered files flying to their new Data Rescue home. 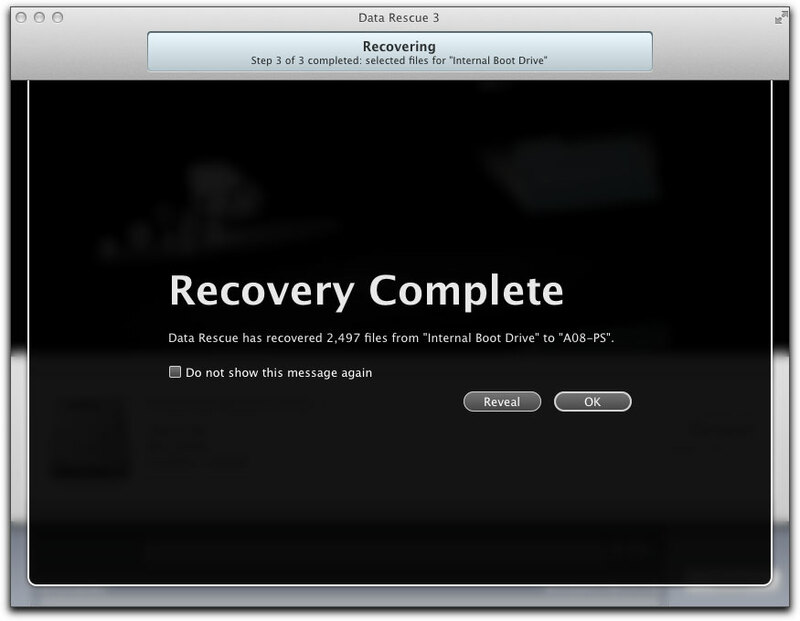 When the recovery of your files is complete you are shown this final window of confirmation. Once that was completed, I opened the test folder I had created and dragged it to the desktop. In the graphic shown below you can see the generic name of the recovered file which I opened up in Pages. I then saved and renamed it as seen on the right. 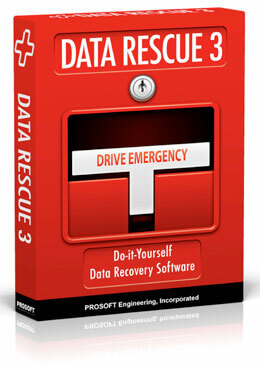 Data Rescue 3 is not inexpensive but not outlandishly priced either. It is one of those applications that you buy hoping you never, ever have to use. 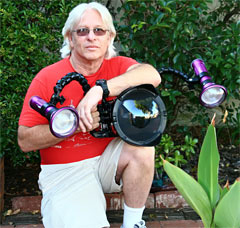 It is like buying safety case savers for your Harley should you ever drop your bike or lay it down. You hope you never do but they can save you thousands of dollars should an accident befall you. It's the same case with ProSoft's Data Rescue 3; you pray you never need it, but if you do, even though it will probably take up a good portion of the day locating just the file you need, it does as advertised and can save the day and possibly a significant amount of money for you.